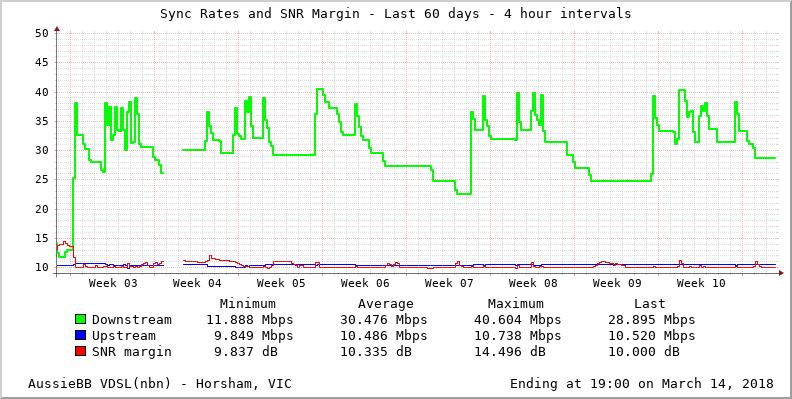 On Sunday I noticed something peculiar - our VDSL NBN connection was still at it's usual maximum speed. This is not entirely out of the ordinary, as it'd frequently be synced at very nice rates after a disconnect, and then would slowly glide down again over the next few hours or days (on occasion) before disconnecting again. The peculiar thing was that it'd been up for 15 days! Indeed, about two weeks before, friends of ours a couple of streets over had been off the NBN for about a week, and Telstra + NBNco were digging up the pits at the end of their street, and I assumed the two things were related. The Friday their internet came back on, ours went dark for a couple of hours, and when it returned, that's when the 15 days mentioned above started. 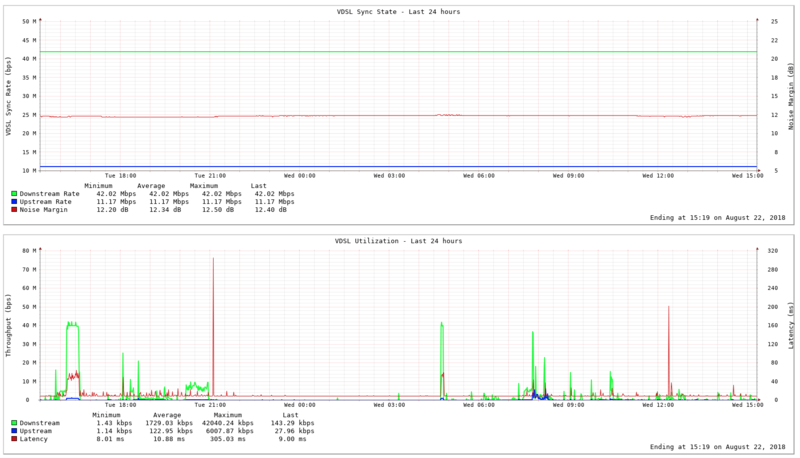 So I had the current sync rates at about 41 and 12, and the fact it'd been synced for about two weeks, and that was all I had to go on, as when I upgraded our NAS I neglected to put the graphing jobs back. Damn it. So I spent Sunday and Monday night rewriting the jobs and getting them ready, then left them collecting data and sure enough, our internet is pretty solid at the moment. I'm fairly well impressed, I hope it stays that way! For comparison, see the 60-day report from March - quite a difference! In the process of rewriting the jobs though, I ditched dpinger and simply grabbed the stats from the Unifi controller, which was already collecting and recording everything I wanted in the resolution I required anyway. I'll hopefully release the script at some point but for now it's too ugly to see the light of day.